These pads are disposible and should be replaced every 2-4 weeks to ensure your filter operates at maximum efficiency. the carbon foam has a finite life span and should be replaced every 8 weeks. 3 x Carbon Foams (Black pads). 2 x Filter Foams (White pads). 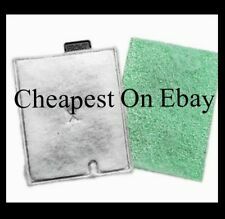 5 x Filter pads (Fine Pads). High quality Two Month service kit for the Edge Glow Aquarium 18L. Using these monthly will keep your aquarium healthy, clean, clear and algae free. As such, we have a huge wealth of experience in online trading. PF3 White x 3. PF3 Carbon x 3. For a cleaner and healthier aquarium it is essential that the PF filter foam pads are replaced regularly. As such, we have a huge wealth of experience in online trading. Replace every month to keep your aquarium healthy, clean and clear. As such, we have a huge wealth of experience in online trading. At present we list nearly 5,000 specialist aquarium & pet products suitable for Aquatic, Reptile, Cat and Dog enthusiasts. Change monthly for crystal clear and healthy water. For the interpret edge glow 18l aquarium. If there's a problem, just let us know and we will fix it. Bright white top light. Integrated back filter with waterfall planter. PF1 White x 3. PF1 Carbon x 3. For a cleaner and healthier aquarium it is essential that the PF filter foam pads are replaced regularly. As such, we have a huge wealth of experience in online trading. As such, we have a huge wealth of experience in online trading. At present we list nearly 5,000 specialist aquarium & pet products suitable for Aquatic, Reptile, Cat and Dog enthusiasts. The fine filter pads are disposable and should be replaced every 2-4 weeks to ensure your filter operates at maximum efficiency. 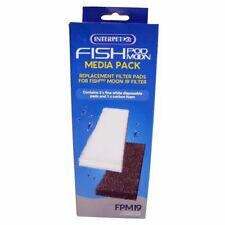 For a cleaner and healthier aquarium it is essential that the PF filter foam pads are replaced regularly. PF Mini Carbon x 4. PF Mini White x 3. As such, we have a huge wealth of experience in online trading. Interpet Service Kit for 19L Fishbox Aquarium. 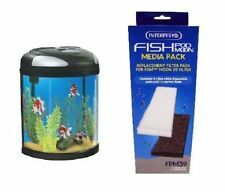 Suitable for an Interpet Fishbox 19 Litre aquarium fish tank. As such, we have a huge wealth of experience in online trading. At present we list nearly 5,000 specialist aquarium & pet products suitable for Aquatic, Reptile, Cat and Dog enthusiasts. Life support for coldwater or tropical aquariums. PF4 White x 3. PF4 Carbon x 3. For a cleaner and healthier aquarium it is essential that the PF filter foam pads are replaced regularly. As such, we have a huge wealth of experience in online trading. PF2 White x 3. PF2 Carbon x 3. For a cleaner and healthier aquarium it is essential that the PF filter foam pads are replaced regularly. As such, we have a huge wealth of experience in online trading. Interpet activated Aqua Carbon 400g packet - Plus 200g. For freshwater and marine aquarium filters. Technically advanced - removes dyes, metals and odours. Unique blend of carbons for optimum performance. Massive surface area. New, unopened packet, slightly shop soiled, plus extra 200g sachet also unopened. Chemical filtration takes place through the black foam inside your fish pod moon filter. As such, we have a huge wealth of experience in online trading. At present we list nearly 5,000 specialist aquarium & pet products suitable for Aquatic, Reptile, Cat and Dog enthusiasts. 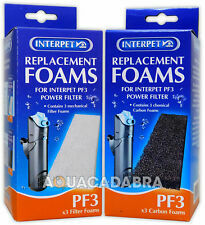 Genuine Interpet External filter foams. I have two boxes of these, each box contains a pair of filter foams. Genuine Interpet External coarse foams. I have two boxes of these, each box contains a pair of filter foams. Power Filter PF Mini Plain Foam. Power Filter PF2 Plain Foam. Simply place a pad next to the carbon foam pad in your PF. These are disposable and should be replaced every 2-4 weeks to ensure your filter operates at maximum efficiency. These Super Fine Filter Pads are for the Interpet PF2 – ensure you get the correct size for your filter.5 x Interpet Super Fine Filter Pads for Interpet PF2.